Let's be honest. The Lake Oswego football team's offensive unit got a ton of attention this year. And to be fair, there was a lot to talk about, with the success of first-year starting quarterback Jackson Laurent, junior running back Casey Filkins' Player of the Year season and the emergence of a new receiving corps including juniors Thomas Dukart and Joe Hutson, and senior Jack O'Brien. But the Lakers' defensive unit was great in its own right. 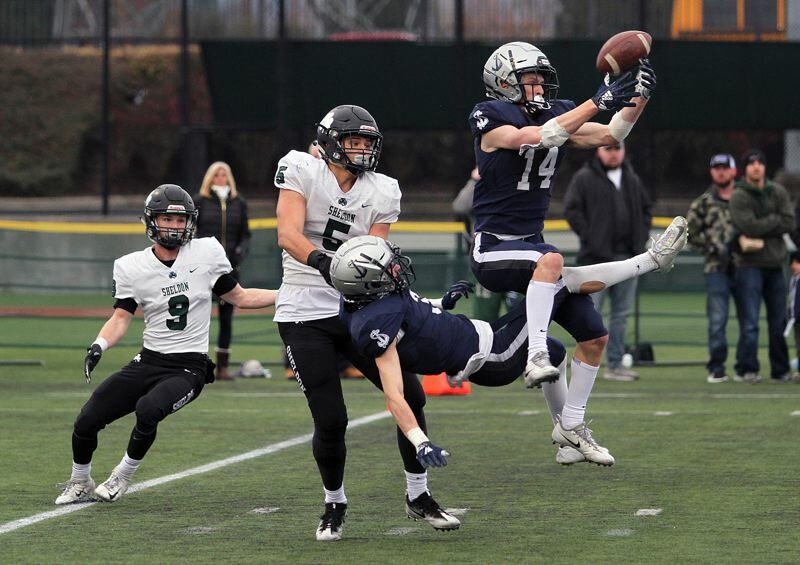 After holding its first 13 opponents to an average of 19 points per game, the Lakers stepped up again in Saturday's Class 6A state championship game against Sheldon, holding the third-ranked Irish to just 27 points in Lake Oswego's 34-27 victory at Hillsboro Stadium. In the process, they kept Sheldon senior DI quarterback Michael Johnson Jr. under control — he ran for 113 yards and two touchdowns and passed for just 114 yards and no scores — and held the Irish 16 points under their 43 points per game scoring average. By the end of Saturday's game, the Irish — and everybody else around the state — had seen just how good the Lakers' "D" really was this year. "Before the game, I think the energy was running high. We were both coming in a little hot," said Lake Oswego senior lineman Mike Mercep the Three Rivers League co-Defensive Lineman of the Year. "But we settled down and we executed. … We wanted to put pressure on Johnson, make him make plays and he tried. He made some plays — he's a great player, same with (senior tight end) Patrick Herbert — but we did good today." "We know (Johnson is) a hell of a good player, a good guy — we've got a lot of respect for him — but we game-planned well," said Lake Oswego senior linebacker Gabe DeVille. "We knew what he was going to do. We had a lot of film on him. We knew that he was going to run around, so we just game-planned for it and executed." While the Irish picked up solid yardage on the ground — in addition to Johnson's success, senior running Matthew Burgess finished with 18 carries for 147 yards and one touchdown — the Lakers' defense was generally successful in limiting the Irish's big plays. "We just knew we had to contain Michael Johnson and keep Patrick Herbert from making big plays and I feel like we did that pretty well," said senior linebacker Bryson Breeze. "We didn't change anything at halftime — we just stuck with it." Most importantly, however, the Lakers came through with the biggest stop of the season when the game was on the line. After the Lakers regained the lead at 34-27 with just two minutes, 33 seconds left to play, it was the defense's turn to step up. Facing Johnson, Herbert — an Oregon commit — Burgess and the Irish's talented offensive line (all five won first- or second-team all-Southwest Conference honors), the Lakers made a handful of the biggest plays of the season. With Sheldon taking over at its own 17-yard line, Lake Oswego senior linebacker Chris Todd made the first big play for the Lakers, sacking Johnson for a 14-yard loss on first down. Next up, LO senior lineman Mario Pronnarongvat did his part when he dropped Burgess for a 1-yard loss on the right side after Burgess caught a Johnson pass. Pushed back to its own 2-yard line, Sheldon answered with its last big play of the game — a 43-yard Johnson-to-Herbert pass down the right sideline. Three plays later, a pass interference call against the Lakers gave the Irish their last first down at the Laker 38-yard line. While Irish had no more big plays in their quiver, the Lakers had plenty. First, Lake Oswego juniors Thomas Dukart and Joe Hutson broke up a pass intended for Herbert at the goal line. Next, Johnson was brought down by Mercep for a 2-yard loss on a scramble. Then, on third down, Johnson threw toward Herbert again, only to see Dukart disrupt the play at the 10. As great as all that was, the Lakers saved their biggest play for last. With Sheldon facing a fourth-and-12 from the LO 40-yard line and the clock ticking down under 30 seconds, Johnson scrambled to his right, trying to buy time because he couldn't find an open receiver downfield. Stymied there, he threw back across the field to junior tight end Ben Mehlhaff at the 40. Mehlhaff couldn't find an opening and just as he was about to be tackled by DeVille, he pitched the ball backward, hoping one of his teammates could catch it and keep the play alive. Instead, the ball bounced to the turf where it was scooped up by Lake Oswego junior lineman Cody Carlson at the 48 and he took it back 23 yards on what turned out to be the next-to-last play of the game. "All I knew was that after I tackled him, the game was over and we won," DeVille said. "I didn't even know he fumbled the ball. We really came together and put in the work and we got here and it paid off." "Our defense has really been able to stop the run all year and we just preached it all week because we know teams want to try and run on us, but we just stuffed them," Carlson said. "We were always outmatched, they were always bigger, but we were always more athletic," Breeze added. "We had bigger hearts."